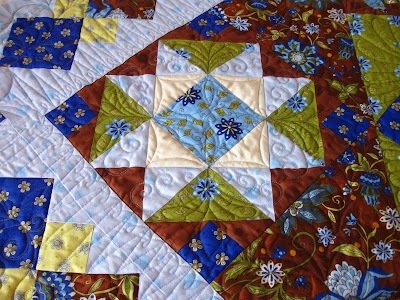 One of the beautiful aspects of quilting—the actual stitching through the three layers of the quilt sandwich—is the dimension it creates. 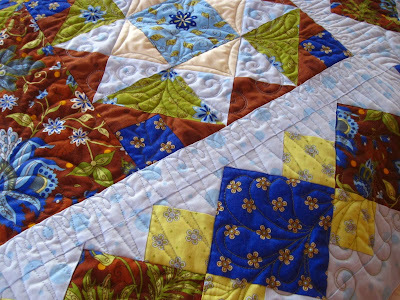 The quilting transforms a two-dimensional quilt top into a three-dimensional bas relief fabric sculpture. 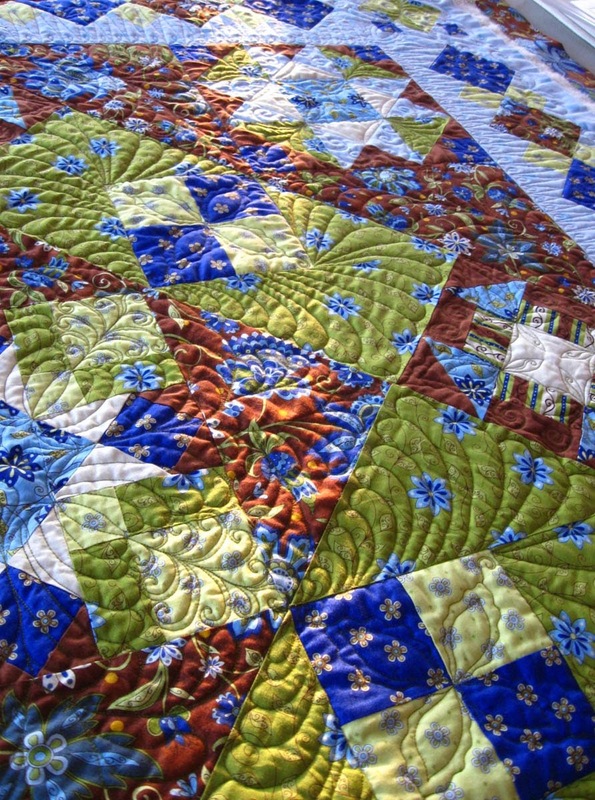 I recently completed the custom free-motion quilting on this quilt for Stacy at Pins and Needles Quilt Shop. This picture was taken as the sun was streaming through my studio windows about an hour prior to sundown—or before the sun disappeared behind one of Chattanooga's mountain ridges. 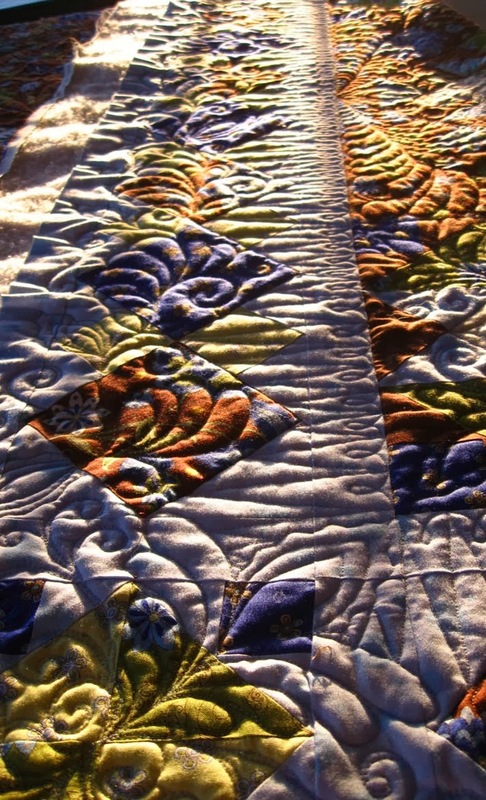 The low angle lighting highlights the dimension and texture created by the quilting stitches. 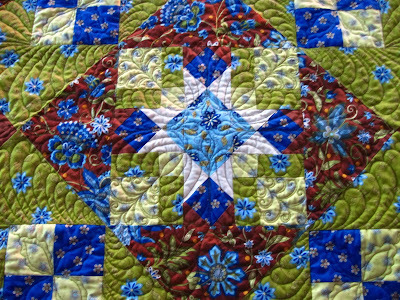 I'll be at the Pins and Needles Open House and Charity Quilt Auction this Saturday, November 23, doing a demonstration of free-motion quilting. I hear there will be door prizes, a retreat give-away, refreshments, demonstrations and a 10% discount on all sales at the Open House. Stop in, say hello and make a bid on one (or three or five!) of the auction quilts. The proceeds will benefit the Salvation Army Angel Tree Program. 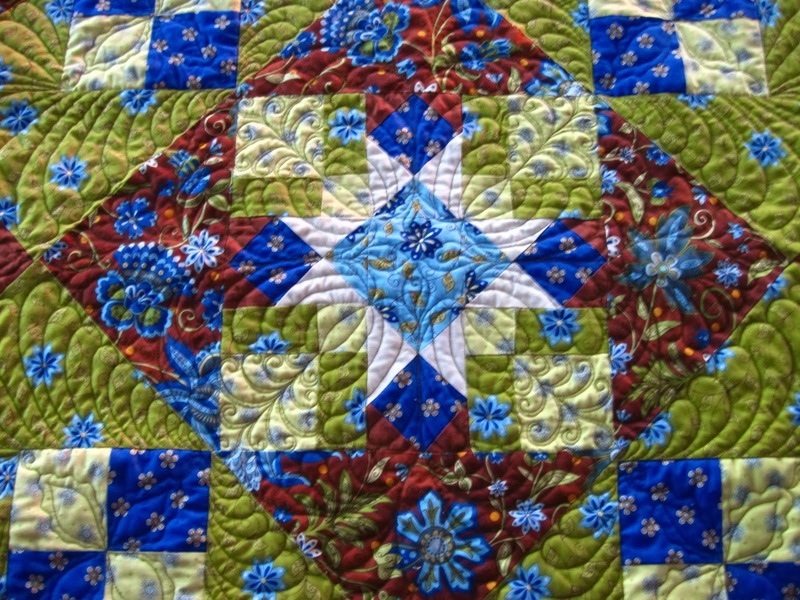 Oh, and Stacy will have this quilt on display, too. Be sure to ask her what part her husband played in the creation of this quilt. Here are a few close-ups. Free-motion quilting: feathers and curly vines. One of the blocks from this 6-month BOM (block of the month) project. Inner and outer border (detail). Three colors of Aurifil 50 wt. cotton (top threads); Bottom Line 60 wt. poly (bobbin); 5 bobbins. Quilt top: 66" x 66" (before quilting).